Sometimes you just have to laugh and tell yourself it’s ok. This morning, as we ate cold cereal (the same kind we had for dinner last night), we couldn’t find clean towels, and the boys dressed for school, I had to laugh about life. 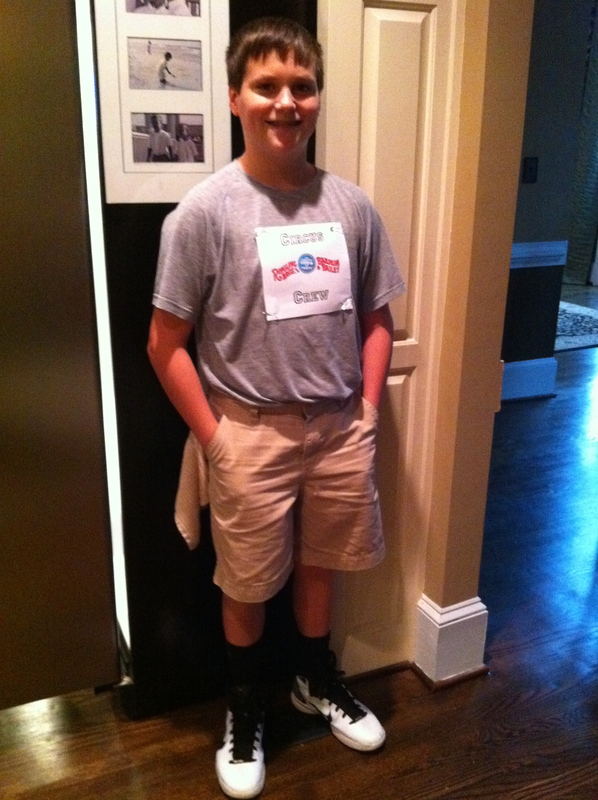 You see, today is “Circus Day” at our middle school. Our youngest two sons, of 6, attend there and had to dress up for this special day. As we opened the door to leave, I realized there was no fanfare, no pictures, no “oohing” and “ahhing” about their costumes. Honestly, there wasn’t much to brag about! Perhaps because through 22 years, 6 sons, homeschool, private school, public school, cancer, moves, “terrible twos and troublesome teens,” loss of parents, lots of victories and many mistakes, we have become minimalists (a nice word for busy, old, and weary!!) by default. has known this all his life-look–he’s still happy! put up with so much, and yet they still love us! While clicking the camera on that dear one, I remembered a different day in our lives. I look back and think I was “better” then. 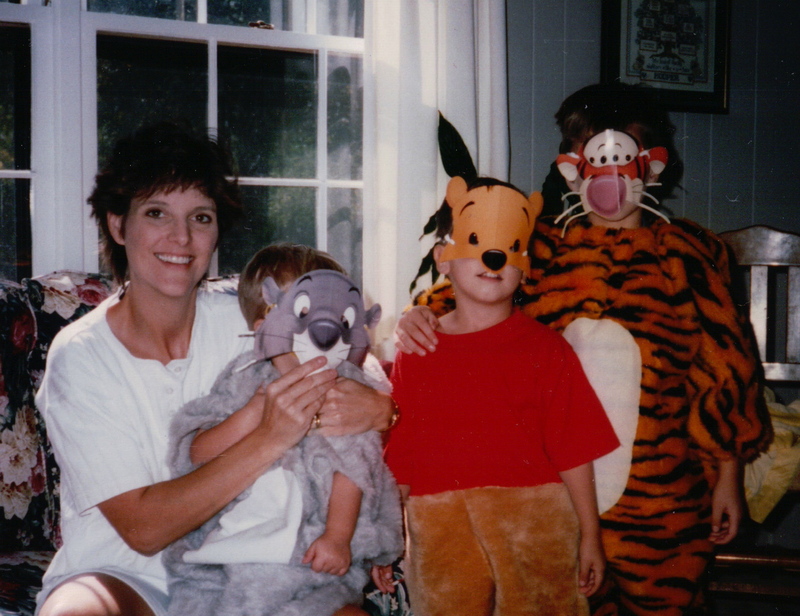 This photo is from Halloween, 1994, we had 3 sons and one on the way. That year I actually sewed their Halloween costumes myself. I look at this and feel proud, then I think, “Yeah, the costumes were great, but was my heart? 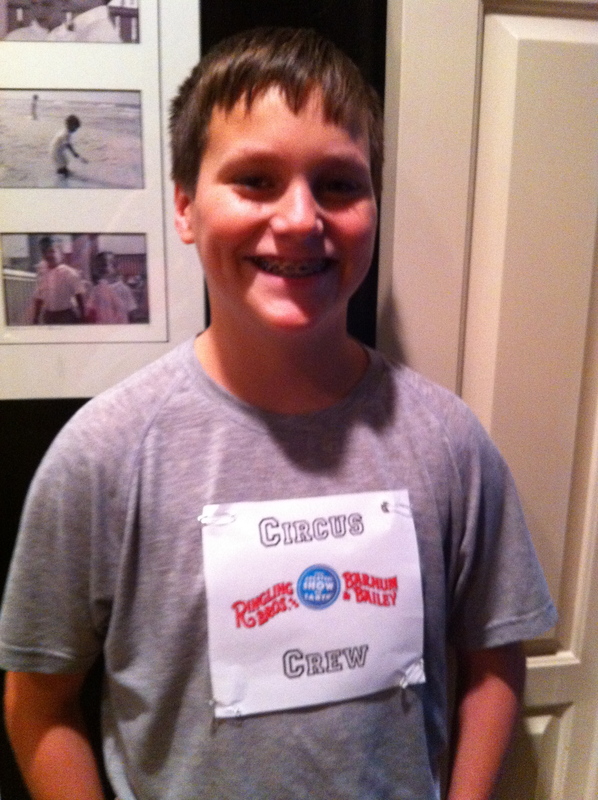 Maybe, honestly I don’t recall…but today as I patiently pinned the “Circus Crew” sign on Cole’s old t-shirt and told him how proud I was of his idea, I felt thankful. Yes, through the journey of life things have changed and many times these days as a parent I feel like a “loser,” especially as we eat cold cereal and wear t-shirts with signs pinned to the front as costumes. However, when I step back and view the big picture, I realize that the beauty of this life is not in the things I can look at and feel proud of, but in the love that transcends all of my pride. We’re still walking, one foot in front of the other, like everyone else, and there’s a lot, a whole lot of love in this home…just like yours. So, today, if you look at your mothering, your fathering, and you think, “Boy, I really come up short,” just put an arm around your child, look them in the eyes, and tell them you love them…and then laugh together as you sit down for a dinner of cold cereal and give thanks to God. It’s ok.